Ant advised in the design of all his own costumes, indebted to historical, military and tribal dress, working with stylists and costumiers. This one is perhaps the most widely known of all, having been used for the publicity photographs and promotional video for the single, Prince Charming, and later on tour. 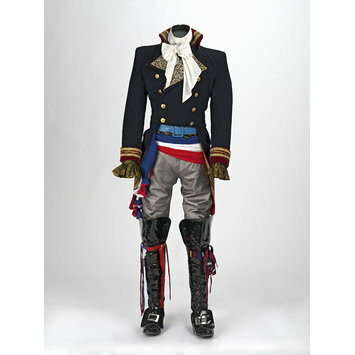 There are two shirts, two pairs of breeches, two wigs and two scarves, not identical but in similar styles, all worn in different combinations on tour. The gold and black striped shirt and the dark silver leather breeches were worn for the publicity photographs and in the video. 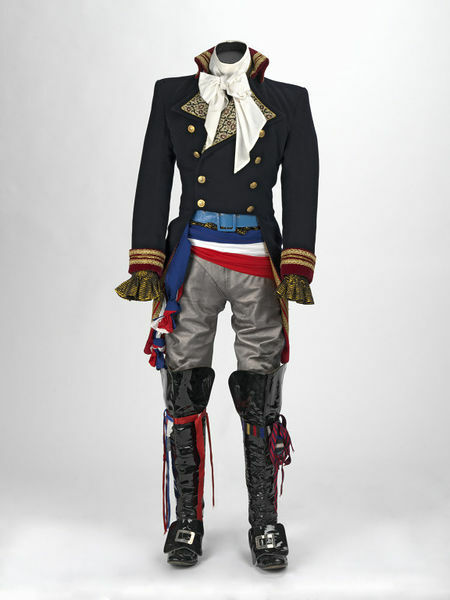 This multi-part costume was worn in 1981 by Adam Ant for the publicity photographs and promotional video for the single, Prince Charming, and later on tour. There are two shirts, two pairs of breeches, two wigs and two scarfs, not identical but in similar styles, all worn in different combinations on tour. The gold and black striped shirt (S.140A-1983) and the dark silver leather breeches (S.140C-1983) were worn for the publicity photographs and in the video.